Undeniably crude in its design and graphics, Baldi’s Basics in Education and Learning is the brainchild of the Indie game developer Micah McGonigal, A.K.A Mystman12. While inspired by the educational games of the mid-80s, it’s more of a parody with a twist of horror. 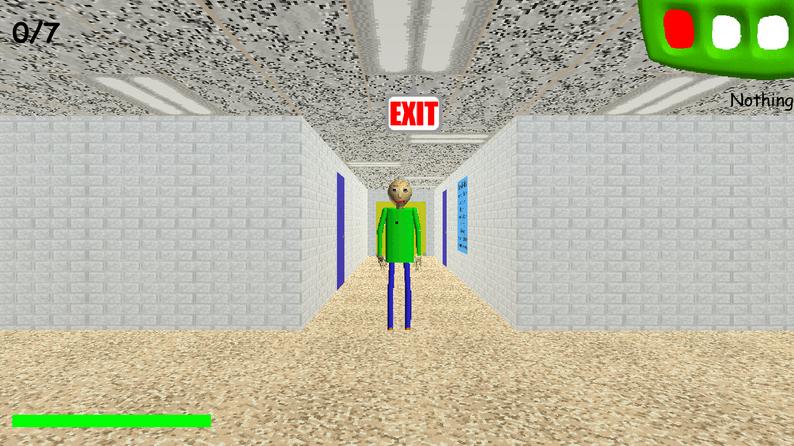 In this case, the main character named Baldi is someone you will need to answer to while the game progress. There are several tasks which a player must do to complete their objective. What objective, might you ask? Escape, plain and simple. After all, this isn’t your typical edutainment video game. As mentioned, Baldi’s Basics has a twist of horror in it. You will learn to avoid Baldi at all costs. Also, be aware that Baldi has many friends who will gladly blow your cover. There are two different game modes you can play. The first has a set about of notebooks you need to collect. In the second, you need to find as many notebooks as possible. 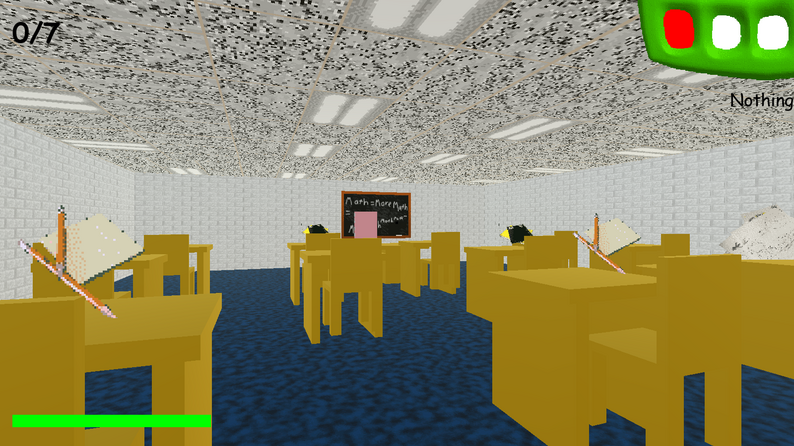 In order to escape the school and ultimately escape Baldi, you must collect all seven notebooks hidden around the school. Sounds easy right? Well, there are many obstacles to slow your progress. Also, you must go about your search all while avoiding Baldi and his friends. When you find a notebook, you must answer the quiz questions correctly. Wrong answers anger Baldi, and the more wrong answer you give, the less likely you are to make it out. As mentioned, there are several obstacles or things that will slow your progress. When approached by students, be extras careful to perform the task well. If you fail any jobs, you will have to start all over again. Since you will be using a keyboard and mouse/trackpad to play, here are the various controls you need. For example, you use the WASD keys to navigate forward, back, right and left. When you hold the shift key as well as the W key, you can. With that said, keep an eye on your stamina bar. Press the space bar to glance behind you; this is especially helpful when attempting to escape. One more useful key to use is the escape button. This allows you to pause and the game. In addition to the keyboard controls, you will use your mouse to steer your character through the hallways. Specifically, use the Left Click to perform actions such as opening doors and to pick up items. Also, use the Righ Click to use an item and use the scroll wheel to change it out. Both Windows and Mac compatible, and both are entirely free to download and play. The latest version is 1.3.2. Here are the full changelog details. Added a new custom cursor. Bully is now easier to be caught Bullying by the Principal. Gave Baldi a tiny speed boost. Fixed Principal punishing you for running when getting pushed by 1st Prize or Gotta Sweep while holding the run button. Added a couple more yellow doors. Baldi now hears exits when they disappear. Made Baldi speed up more slowly in endless mode. In conclusion, as long as you don’t have high expectations, then you won’t be disappointed. This is both true for this game, and with life in general. 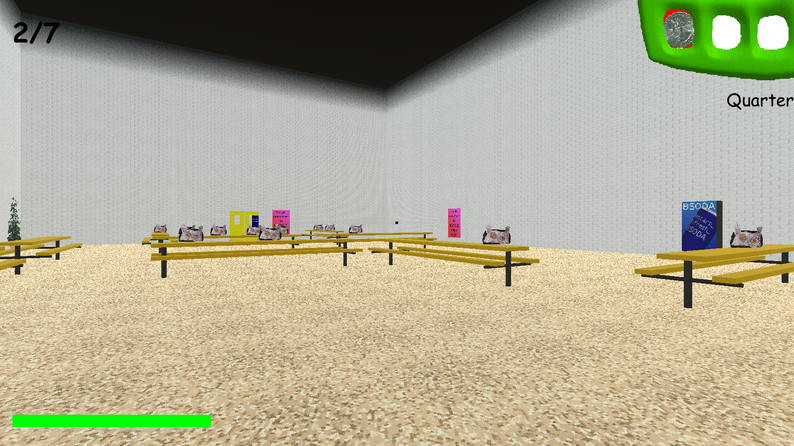 After all, Baldi is a free game, produce with a small budget (if any). You’ll find it challenging and possibly even frustrating. Stick with it, and you will be successful, Or not. 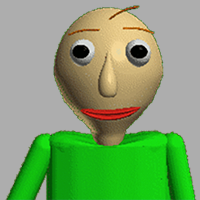 What do you think of Baldi's Basics? Have a question or comment? Leave a comment below.